Rachael’s Cruise Journal: February 6 | Rachael D. Mueller, Ph.D.
Hello again from down south! The weather has finally started to live up to my expectations of Antarctica: rough seas, wind sprayed whitecaps, and an icy nip to the air. The N.B. Palmer is eating it up! Riding solid and stable, she feels as if we are in just a wee bit of ocean swell, and I have to look out my port hole to remind myself that the weather *is* really crappy (albeit not too crappy. “only” 15-20 ft. seas and 40 knot winds that are gusting to 50 knots). The lack of landscape or wildlife combined with this new rocking lullaby has been good for me: I finally got a much needed 7 hrs. of sleep and went back for another 5! The 24 hrs. of sunlight combined with cool things to see had wired my brain to keep me awake, so I really needed this storm to get some shut eye (and thankfully, I don’t get sea sick). Yesterday’s watch was our first watch of active sampling. We started with a series of CTD stations forming a straight line from the coast out to sea and ended with the excitement of installing a set of instruments on the bottom of the ocean (aka a mooring) while waves splashing over board, bergy bits floating by and a flock of Antarctic Petrels circled around us. Dare I say…it was epic! Towards the end of my watch, I was asked to help with the deployment of a mooring, which will float above the ocean floor (but well below the ocean surface) and will continually monitor temperature, salinity and currents. Of course, the chance to be out on deck in such “nice” weather sounded great, so I jumped on the opportunity. What a blast! 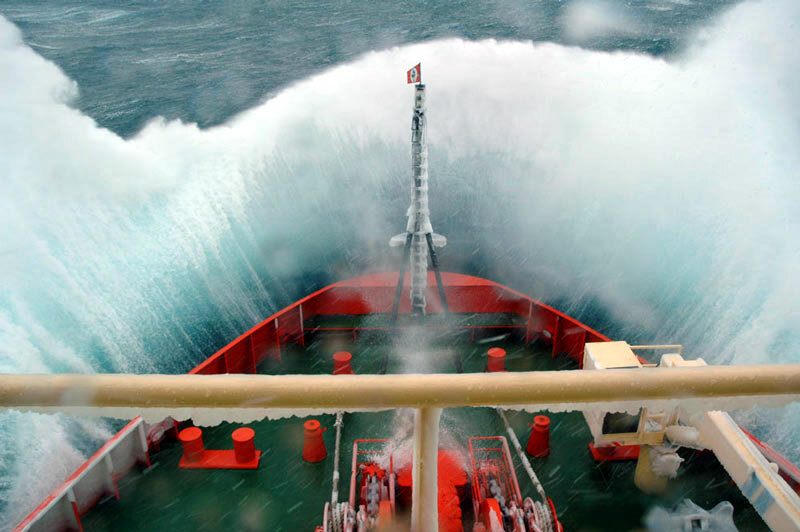 The swell and wind were definitely picking up, which made the operation a bit of a challenge, but we successfully deployed the instruments in time, before the real foul weather set in, and it was quite a thrill to be on deck and getting wet as waves splashed over the rails. Now we’re returning south to Ross Island.